In the era of global communication, mathematical concepts that help controlling information flow become increasingly important. In particular, Markov chains, first introduced in 1906, are currently applied in information search processes and in the analysis of information flow, which are at the very heart of search engines and the internet industry. In 1998 the algorithm used by the Google search engine was described in detail by Sergey Brin and Larry Page in their seminal paper. 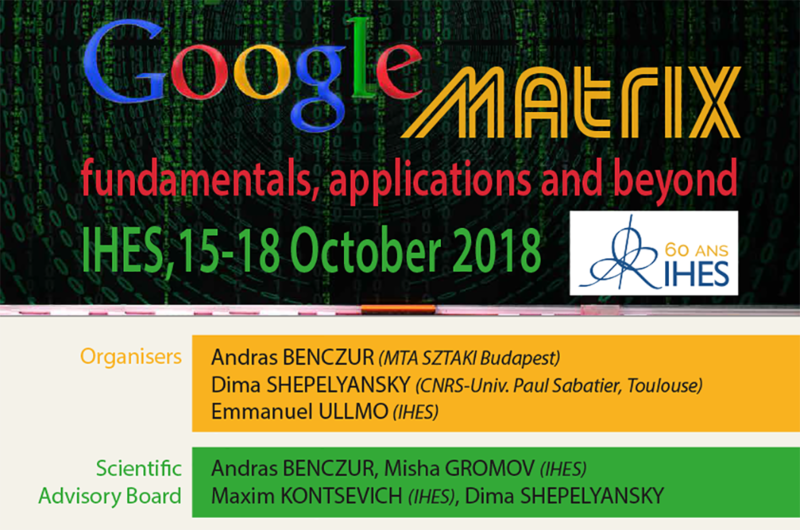 Twenty years later, with the GOMAX conference held from 15 to 18 October 2018, IHES wanted to create new contact points between mathematics, physics, computer science and the high-tech industry by hosting a conference which will review key milestones, as well as the future research directions on the efficiency and control of information flow on directed networks. The workshop has been organised by Andras Benczur (MTA SZTAKI Budapest), Dima Shepelyansky (CNRS-Univ. Paul Sabatier, Toulouse) and Emmanuel Ullmo (IHES). The list of speakers included: Paolo Boldi (Università di Milano), Jean-Philippe Bouchaud (CFM, Paris), Sergey Dorogovtsev (University of Aveiro), Leonardo Ermann (Comisión Nacional de Energía Atómica, Argentina), Klaus Frahm (Université de Toulouse), Katia Jaffres-Runser (IRIT, INPT-ENSEEIHT, Toulouse), Ravi Kumar (Google CA), Jose Lages (Institut UTINAM, Besançon), Yann LeCun (Facebook AI Research), Matteo Marsili (ICTP Trieste), Stéphane Nonnenmacher (Université Paris-Sud, Orsay), Robert Palovics (Hungarian Academy of Sciences), Lior Rokach (Ben-Gurion University of the Negev), Jean-Jacques Slotine (MIT), Andrew Tomkins (Google CA), Piet Van Mieghem (Delft University of Technology), Andrey Zinovyev (Institut Curie). 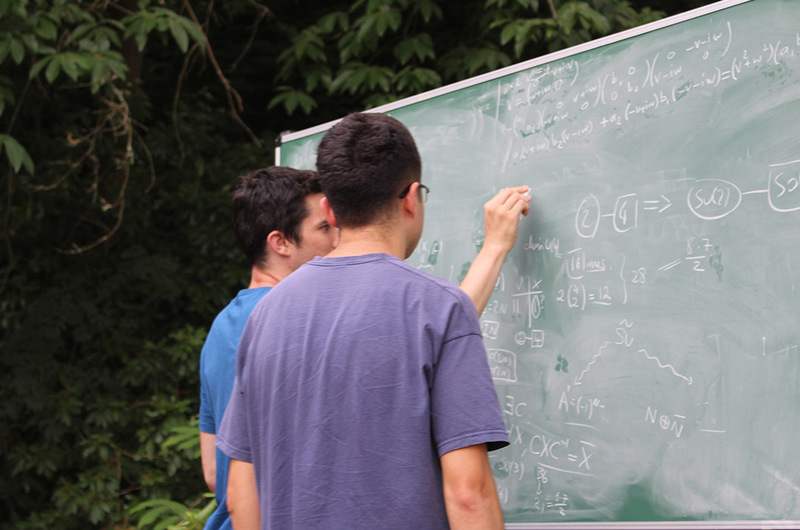 The scientific advisory board consisted of Andras Benczur, Misha Gromov (IHES), Maxim Kontsevich (IHES), and Dima Shepelyansky. 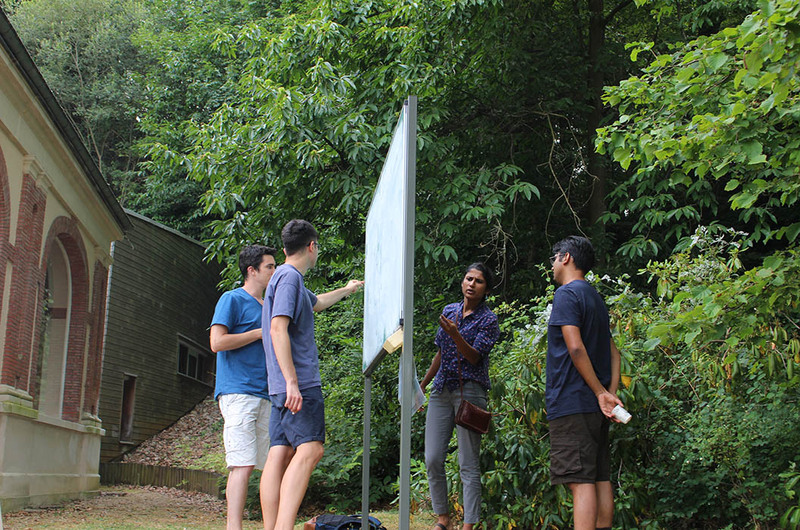 IHES is currently accepting applications for its general visiting programme. 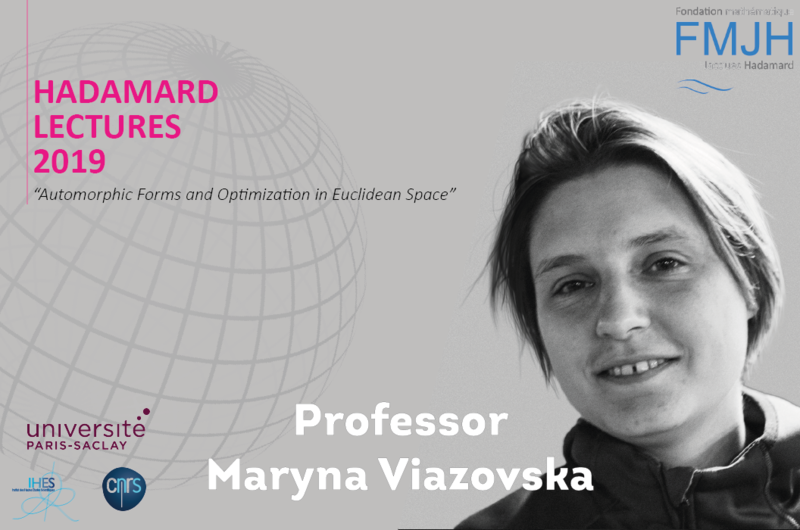 Professor Maryna Viazovska will give a series of 6 lectures at IHES in April and May.